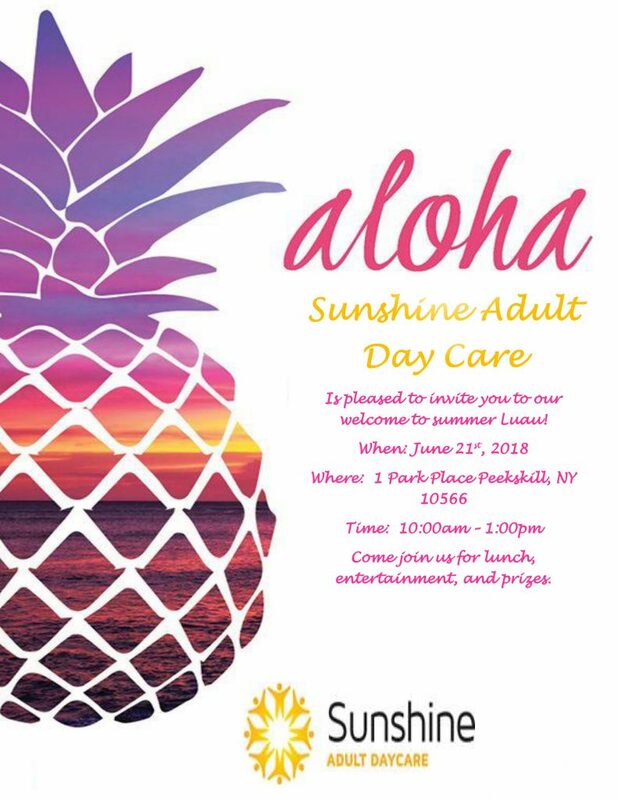 On June 21st, 2018 Sunshine Adult Day Care in Peekskill NY will be welcoming the summer with a luau. Our doors open at 9 am for a lite breakfast and coffee but the fun begins at 10 am. At 10 am we will have some music played for us by a local guitarist. The Hula dancers performance will begin at 10:30 am, she will not only be dancing but teaching. Come on in if you want to learn some traditional Hula moves or have your picture taken with a hula dancer. Please stay and join us for lunch and desert around noon, after lunch, we will be raffling off our door prize. We are located at 1 Park Place Peekskill NY. We look forward to seeing you there!